Delta Smoak are a fully live five piece band who will take you on a musical road trip through the American heartland. Having performed in Nashville, New Orleans and Chicago they recreate classic tracks from The Eagles, Johnny Cash, Bruce Springsteen, Elvis and many more legendary acts that will have you dancing the night away. 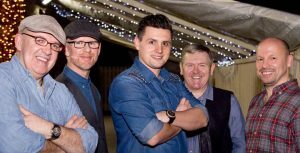 This year, we are delighted that they will be playing for us on both Friday and Saturday evenings. You can listen to a couple of tracks here. Check out the band’s Facebook page here.